Mariota (No. 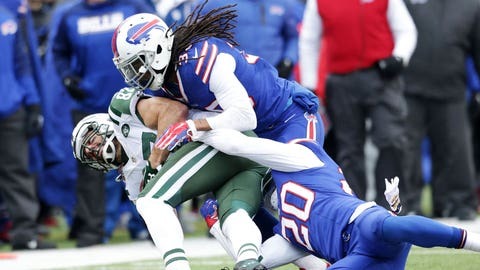 8) suffered a knee injury against the Dolphins. Tennessee Titans rookie Marcus Mariota will not play Sunday against Atlanta as he recovers from a sprained MCL in his left knee. Zach Mettenberger will start at quarterback. 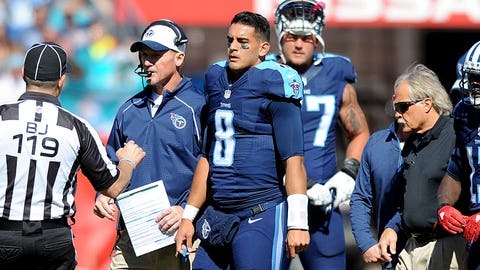 Coach Ken Whisenhunt said Friday that Mariota has been ruled out after missing practice all week and the rookie’s knee has not quite healed up. Mettenberger practiced as the starter in Mariota’s absence. "It’s a combination of missing practice and not quite being there (physically)," Whisenhunt said. "He’s close, but it’s a combination of those two things. We decided that was the best way to go this week." Mariota sprained the medial collateral ligament in his left knee when hit low by Miami defensive end Olivier Vernon in last week’s 38-10 loss to the Dolphins. Mariota stayed in the game wearing a brace, while the NFL has fined Vernon $17,363 for the hit in the knee area and another $20,000 for hitting the quarterback later in the head and neck area. Mettenberger started six of the seven games he played last season as a rookie. The sixth-round draft pick out of LSU still is looking for his first career win, and he threw for 1,412 yards with eight touchdowns and seven interceptions last season. Mettenberger said that helping the Titans (1-4) end their four-game losing streak is of more importance to him than being back under center as the starter this week. "The important thing is we go out there and try to get a team win. That’s ultimately my job. It doesn’t matter who’s out there at quarterback, everyone is expecting us to win a ballgame, and that’s what I’ve been working toward," Mettenberger said. The Falcons (5-1) have studied Mettenberger, and coach Dan Quinn said what is most noticeable on film about Mettenberger is his arm strength. "I went back through the passes from him," Quinn said. "I think the thing that jumps out at you is the arm strength. He can really spin it. That’s probably the thing that jumps out the most." The Titans also will be without wide receiver Harry Douglas (ribs) and starting cornerback Perrish Cox (hamstring). Whisenhunt said safety Michael Griffin, who practiced fully Friday with an injured left knee, is questionable. Notes: Nose tackle Sammie Hill (right knee) also practiced fully and is questionable. Linebacker Avery Williamson (hamstring) practiced fully and is probable after missing last week’s game. RB Dexter McCluster practiced fully for a second straight day Friday and is probable.